The University of New Mexico, a certified RhinoFabStudio, is trying a different approach to advertisement. UNM's Senior Lecturer III and the Director of the School of Architecture and Planning’s Fabrication Laboratory, Matthew Gines, took part in this project with the help from four university students. Gines specializes in digital fabrication, design-build, representation, and technology as it relates to design in academia and the architecture profession. He is also a 2015 RhinoFabStudio Mentor. LoboScape is a visual installation that welcomes travelers as they exit the revolving doors from the arrival gates into the Albuquerque International Sunport. Projected onto a custom fabricated display, it uses the latest technology in visual arts to tell the story of The University of New Mexico and its people. 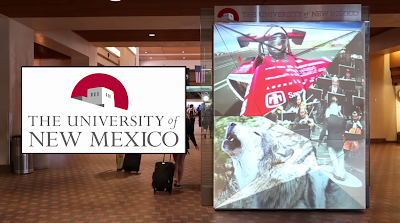 The exhibit features a 3 1/2 minute loop of multiple projected images on multi-faceted and triangulated surfaces about the achievements and events at the University of New Mexico.